Anita is an experienced primary school teacher who has recently published five teacher resources books for mathematics, including a series of books for Years 1 to 6 with a focus on problem solving. 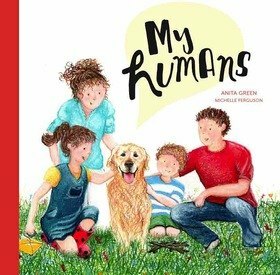 My Humans is her first children’s picture story book. Hopefully the first of many! Inspiration for this story has come from her own family which consists of one crazy husband, two energetic kids, one lazy dog, one sunbaking lizard and two lively fish! All of whom are very supportive of her constant writing, typing and scribbling. It’s the adventures they have been on, the experiences they have had and the fun they have shared that provides her with endless ideas for her stories. Anita currently works as a primary school teacher part time as well as lecturing at Monash University. She has a Bachelor’s Degree in Early Childhood Education and a Graduate Certificate in Education Research. Anita has always had a passion for quality children’s literature and has used books in the classroom to immerse students in a range of learning experiences across all areas of the curriculum. Anita hopes to publish many more stories about Buddy and the adventures he has with his family. Engaging and captivating stories about their lives told through the eyes of Buddy!